The board of directors has reached an agreement with Rex W. Tillerson, former chairman and CEO, to sever all ties with the company to comply with conflict-of-interest requirements associated with his nomination as secretary of state. Tillerson would also surrender entitlement to more than US$4.1 million in cash bonuses, scheduled to pay out over the next three years, and other benefits such as retiree medical and dental benefits, and administrative, financial and tax support. The one-time payment to the trust would be equal to the value of Tillerson’s cancelled shares based on a volume-weighted average price per share. Consistent with guidance from federal ethics regulators, the value would be reduced by about US$3 million. The trust would include forfeiture rules that would prohibit Tillerson from working in the oil and/or gas industry during the 10-year payout period. The trust rules dictate that in the event of forfeiture, the money would be distributed to one or more charities involved in fighting poverty or disease in the developing world. Neither Tillerson nor ExxonMobil would have any control over the selection of the charities. The net effect of the agreement is a reduction of approximately US$7 million in compensation owed to Tillerson. Tillerson retired on Dec. 31 with more than 40 years of service with ExxonMobil. 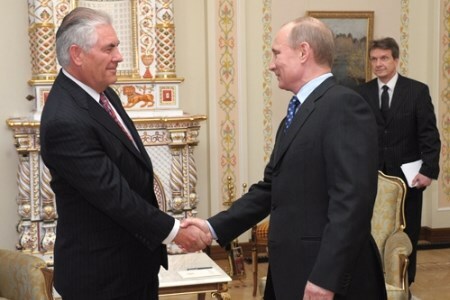 Separate to the agreement with ExxonMobil, Tillerson has also committed to the State Department that, if confirmed, he would sell the more than 600 000 shares in ExxonMobil he currently owns.